Remember this quilt? 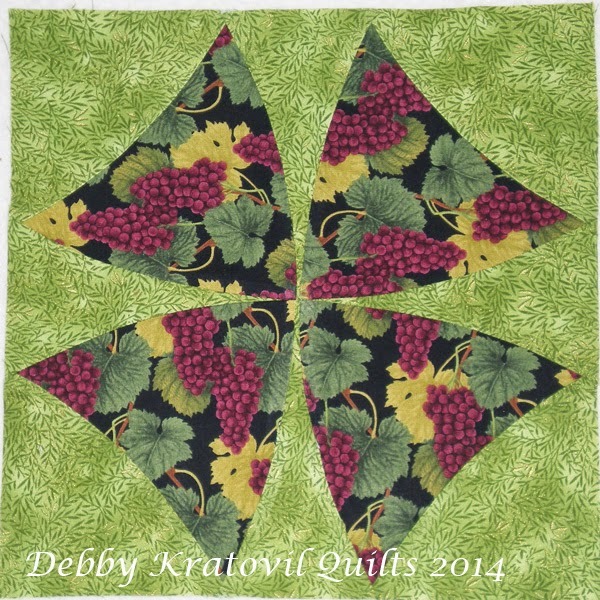 I made it last summer using a collection of reproduction prints by Mary Koval. You can see some of the details HERE. The center compass was drafted on a LARGE coffee filter (think: Starbuck's). Then I cut it apart and paper pieced the sections and stitched it back together. Added the geese halo. Now, we're talking BIG! 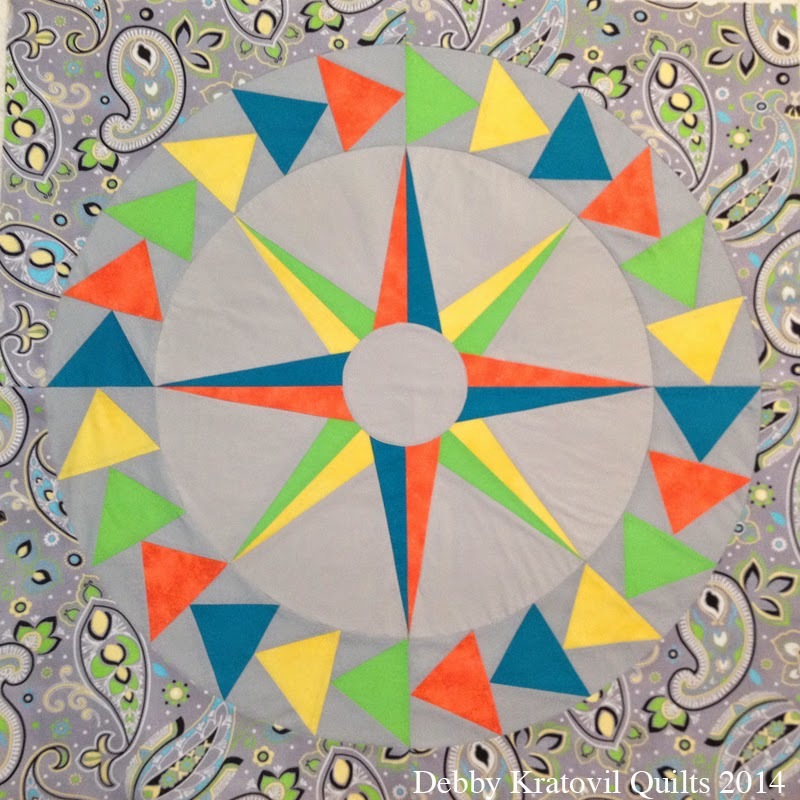 This is a new class that begins at the Quilting LIVE! Show in Atlanta, GA (September 11 - 13). I realized that not everyone enjoys these colors and felt I had to make another one using today's fabrics (can you say "solid"?) and so this is what I got . . . Yes, there is a slight difference in the grays. The compass gray is a little lighter than the gray in the geese halo. 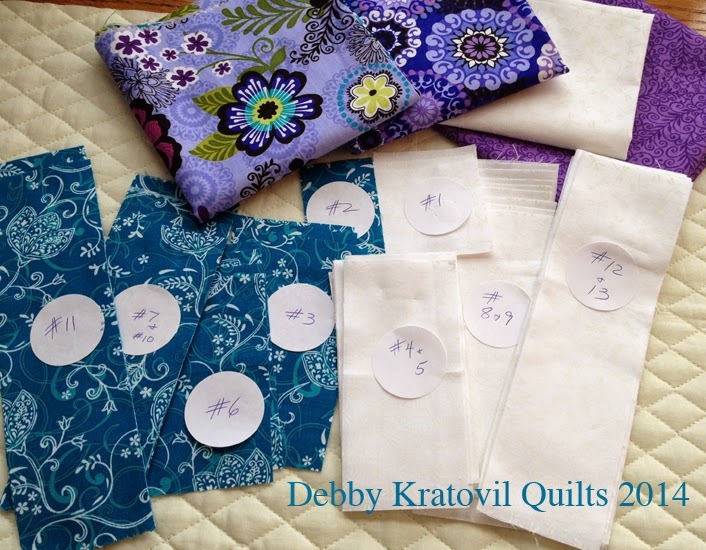 My friend Jean Ann Wright (my former editor at Quilt Magazine) helped me with the color choices and the local quilt shop owner, Kathye Gillette (Quilter's Studio in Fairfax) helped me find the right grays. Thanks to both! 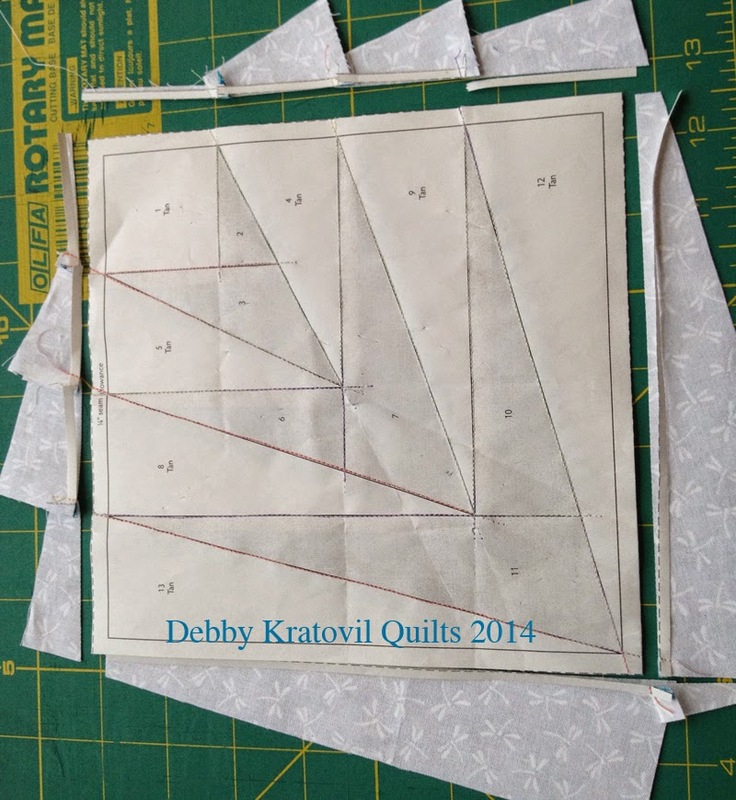 I hope that if you're in any of the future cities where the Original Sewing and Quilt Expo visits in the next 12 months you'll consider taking this class. 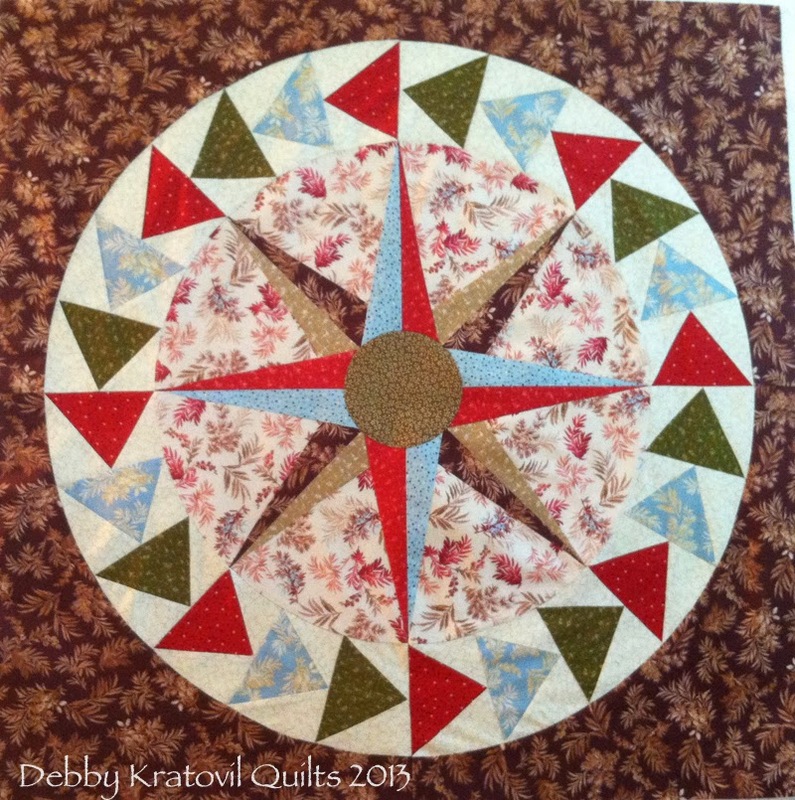 Tell me which one of these two compasses you prefer (ie, the fabrics). This isn't a contest, but I don't assume everyone is a modern girl! And I really still love the first one! Julia is in my local quilt bee. 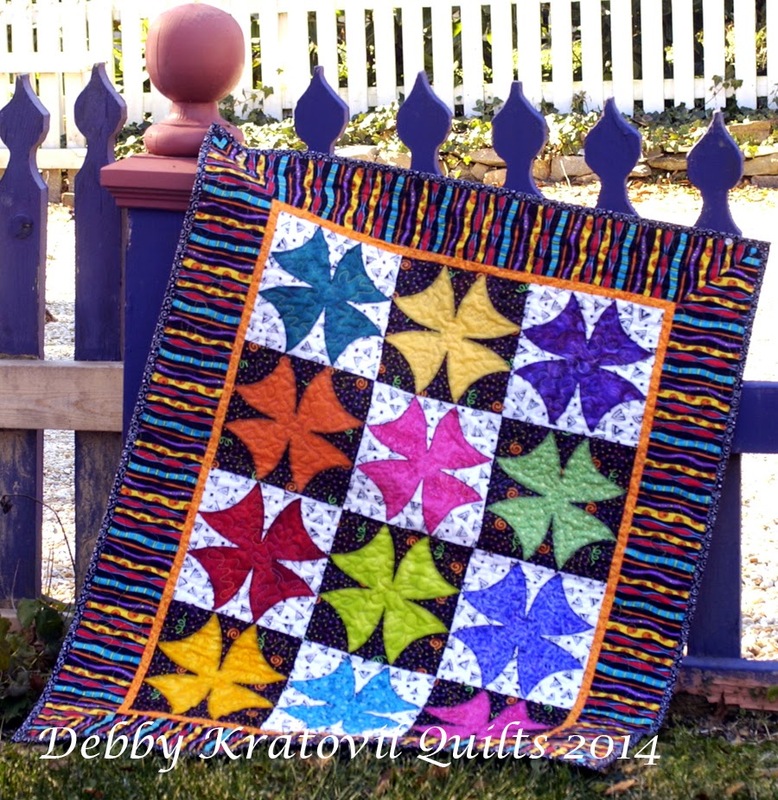 We meet on Thursdays and we all inspire each other and share good quilt stories and info. 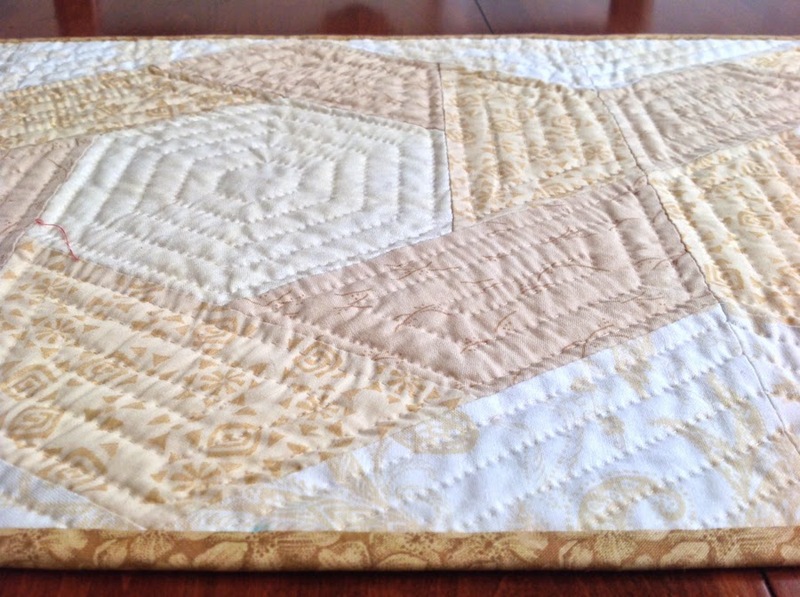 She took my Twisted Hexagons workshop in January which I gave for my guild, the Fairfax Chapter of Quilter's Unlimited. She quietly stitched for the three hours - BY HAND, did you catch that in the caption above?!! Wow. Truly beautiful. I am a high contrast person. Brights. Darks. Batiks. Fabrics that shout, "Look at me!" She took it one step further and hand quilted everything, finishing the last stitch this morning. She sent me a close up of her work . . . I should say that Julia works at Jinny Beyer's quilt shop in Falls Church, VA. And we all know that Jinny hand pieces everything! 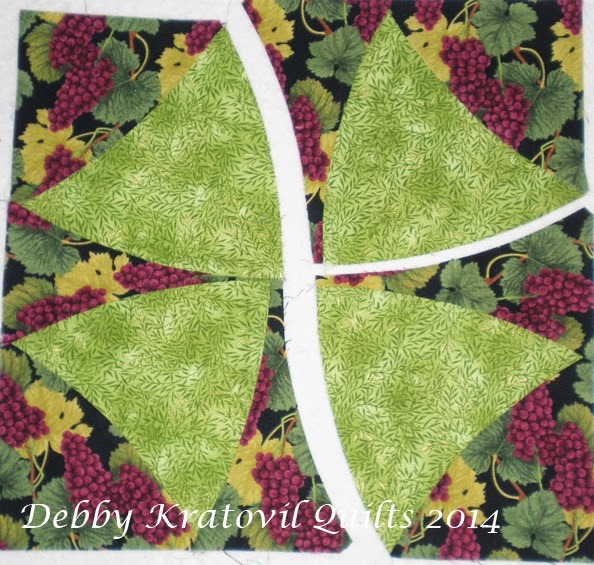 I am the sewing machine queen and haven't ever hand pieced anything. (Well, I did once; I threw the pieces into the trash can and ran for my machine.) I used to hand quilt but I get paid to FINISH quilts, so I'm sort of a mercenary in that respect. So, thank you, Julia for sharing your work of art. One of the finest I've seen in a long time, wouldn't you agree? 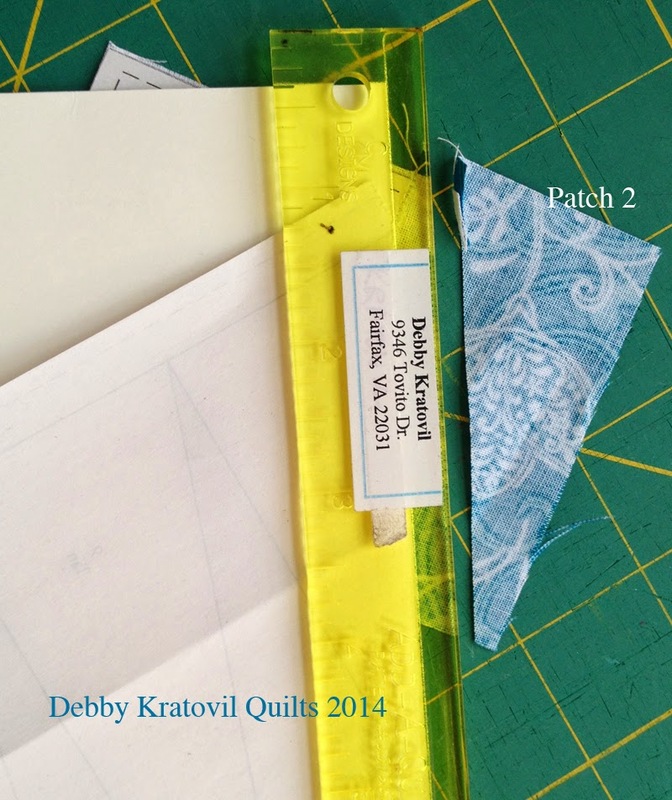 I had my first lesson on the Handi Quilter last week at the Quilter's Studio in Fairfax, VA. 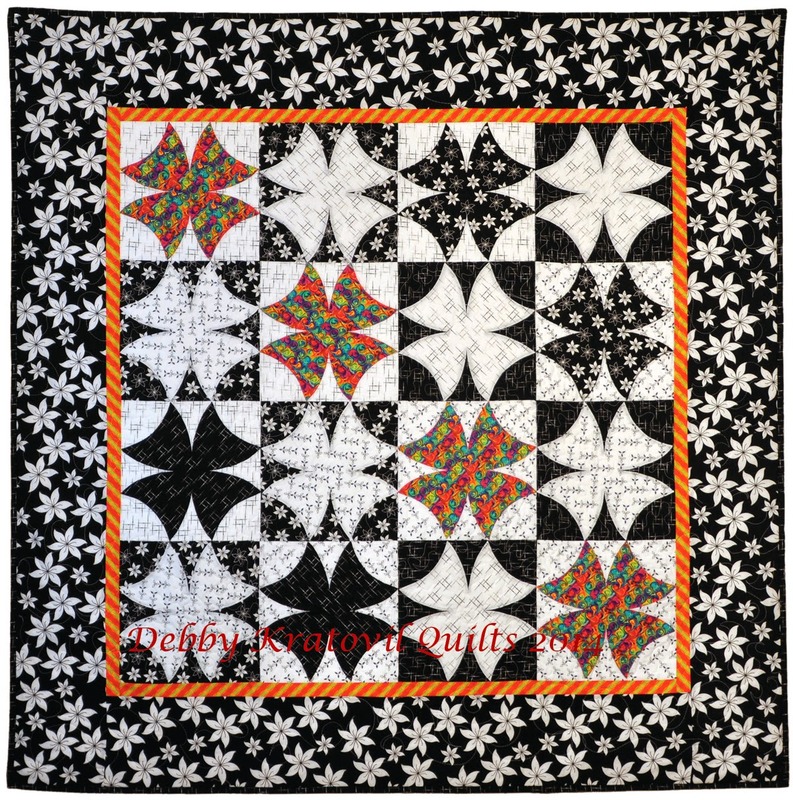 I quickly pieced this Lone Star quilt using the Season's Greetings Collection from Benartex. (This will be a new pattern soon). 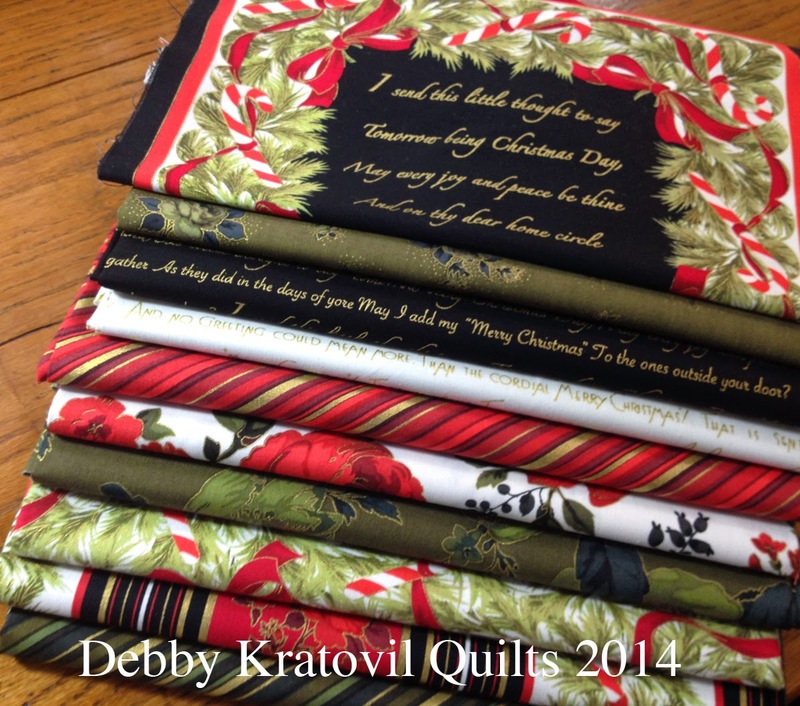 Would you love to see this holiday collection and have a chance to win a fat quarter bundle of the fabrics? Well, you must get on over to the Sew in Love with Fabric blog (Benartex) and see the fun projects I made with them (besides this Lone Star). Visit the Sew in Love with Fabric blog and leave a comment about my use of the wonderful little panels included in this fabric group. Then come on back here and let me know, too. I will let Benartex select the winners. 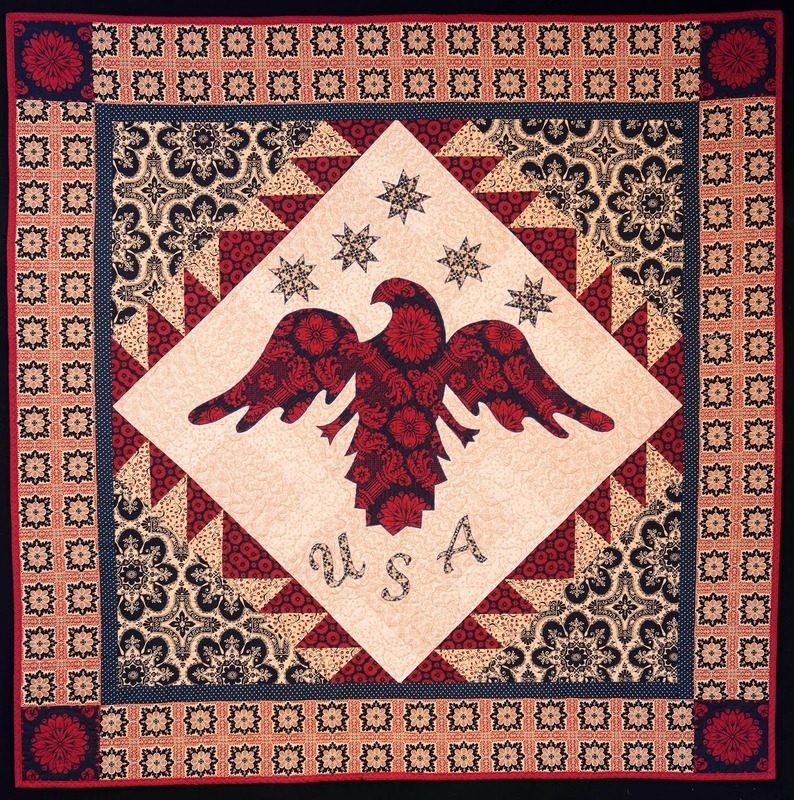 Today at the Martingale blog quilting calendars are featured. My block a day calendar is still going strong after 7 years! It's perpetual and not tied to any one year (not to be confused with the annual block a day calendars I publish with another publisher). And you can see ALL of the blocks on my web site. Yes, all of them in full color. 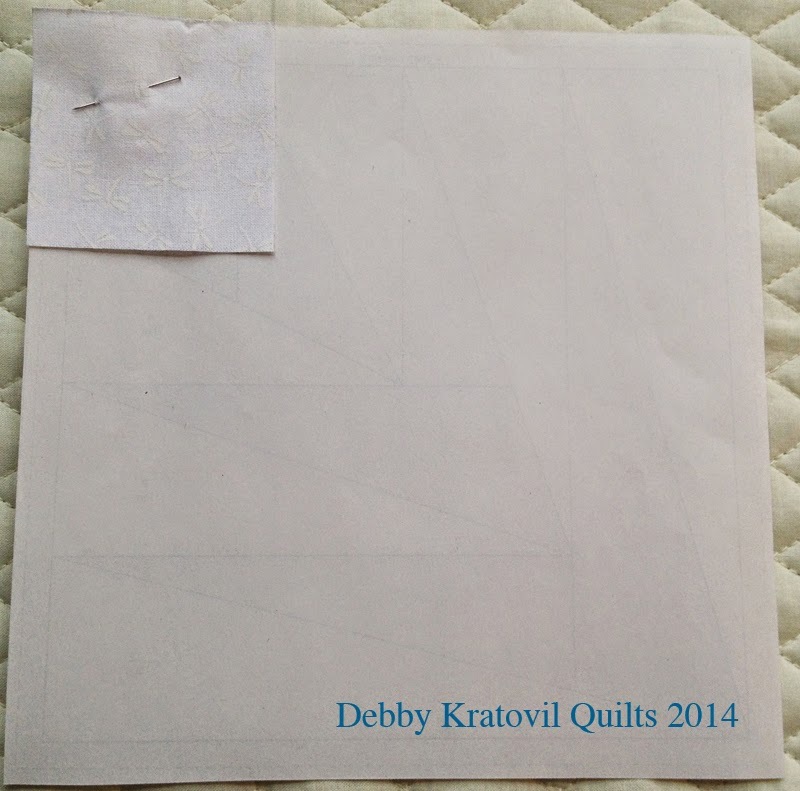 The CD has all 366 blocks in 2 sizes AND 12 quilt patterns made using some of the blocks in the calendar. AND I created 12 more patterns to go along with it. And what's my giveaway? A copy of the Quilter's Block-a-Day Calendar in CD version. 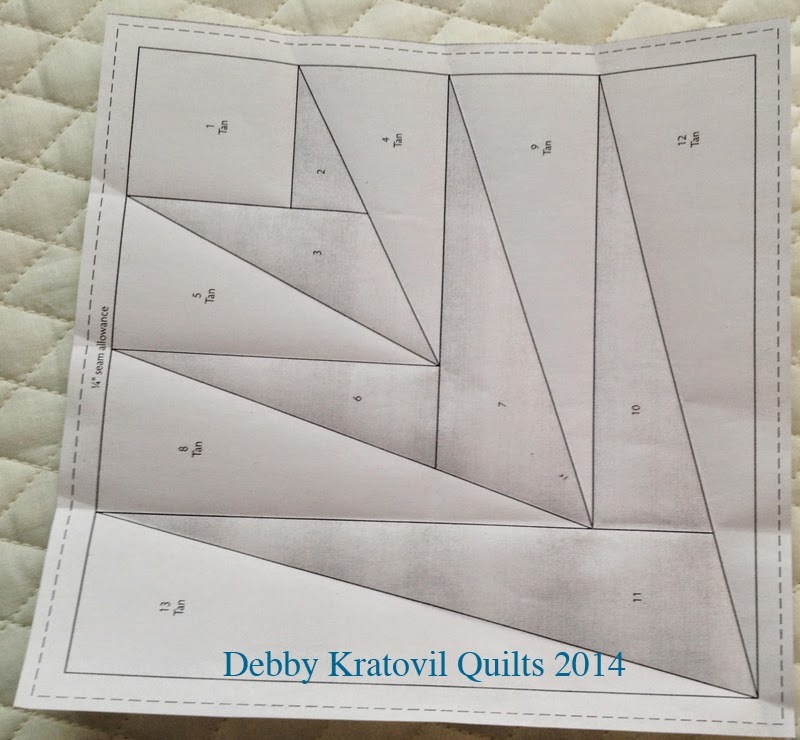 Just tell me if you look for quilting calendars each year and where you buy them. Contest is over Monday at midnight (EST) July 21. Contest is open to everyone, including international visitors! Easy? Are you nuts? This quilt is NOT easy, you may say. But look closely. Those are TWO patches only for each block: a background square and a single applique patch that mimics the crazy, multiple patches of a traditional Winding Ways block. Well, what does a traditional block look like? 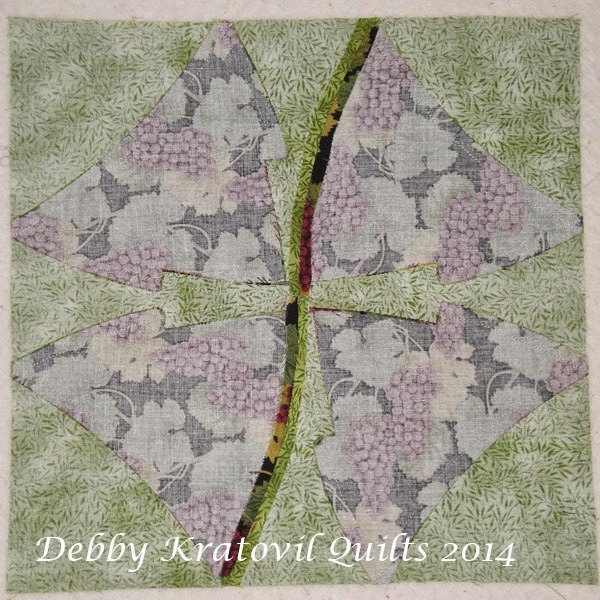 Single Winding Ways block pieced with 12 curved patches - Yikes! Well, it LOOKS like it was appliqued. I don't believe you! Well? Do you believe me now? And can we see the seams in the back? Look close! Those are all seams and you really have to press them EXACTLY as shown. And did you make only one block? Of course not! This was a class a few years ago. But I spared my students the crazy nightmare of cutting out their patches. I supplied laser cut kits for all the patches, done for me from John Flynn's company. His daughter Kate handles this part of the business and my students were ecstatic (as was I) when we sat down to piece. 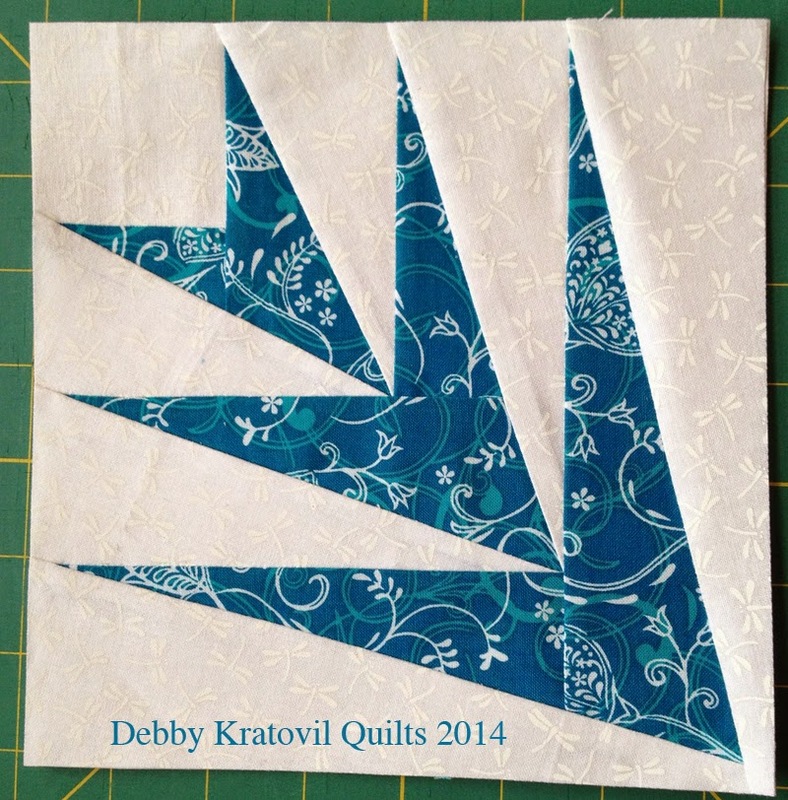 Here are the TWO quilts I made as class samples. The blocks are 10". Don't you love the way I used the fabric in the inner border? I had to! Or I would have had to introduce a fourth fabric. And, oh yes. I made two other quilts . . .
Pre-cut kit of Benartex flannels. This was before the border. 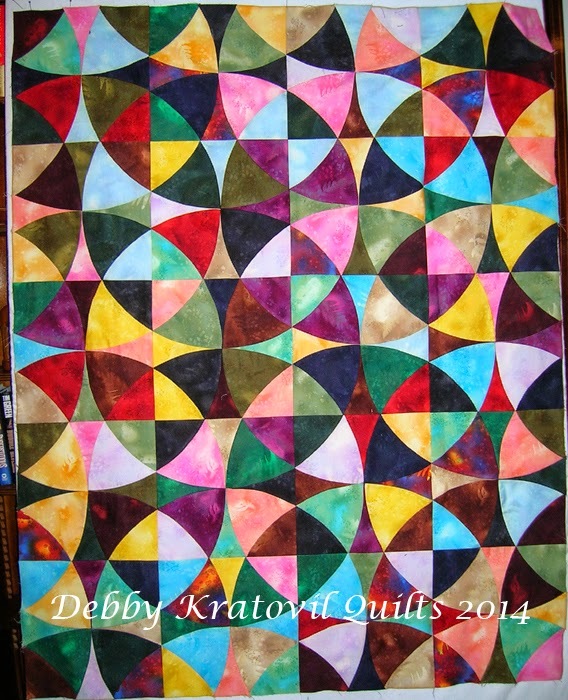 This appears as the July quilt in my 2014 wall calendar of quilts. Appropriate for our Independence Day celebrations today on the 4th of July. Liberty and freedom from government oppression. We still want it, have it (most of the time) and sometimes still fight for it when the rules get a little suffocating. I designed this for Windham Fabrics in 2008 and a certain magazine picked it up to publish it. Then the magazine went bankrupt and I never got paid (that's how it works when you're the little guy, even though without quilts there would have been no magazine in the first place). My nephew saw it in the calendar and loved it. It's his. I just discovered that Windham has put a FREE DOWNLOAD OF REGAL EAGLE on their web site. 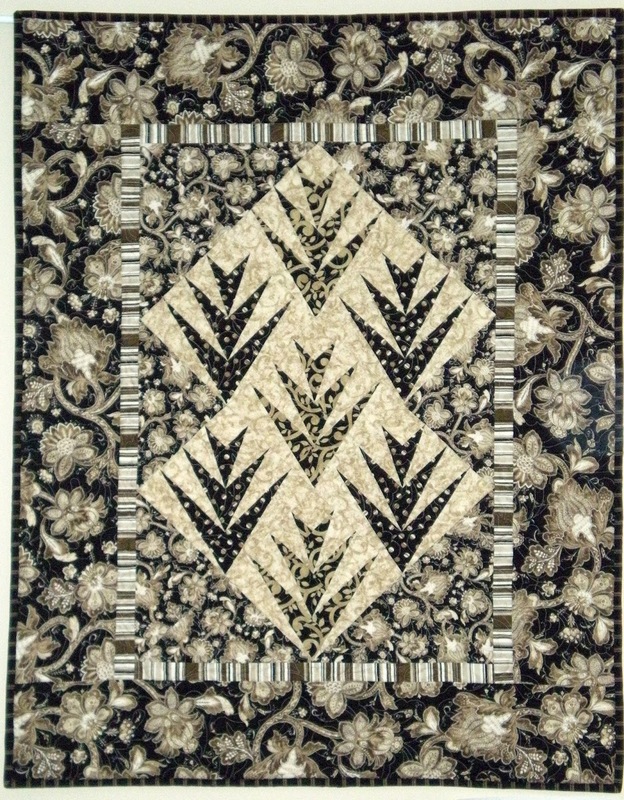 This was a pattern that was included in partnership with the National Coverlet Museum and their reproduction coverlet fabrics. It is the same as Patriot's Day. 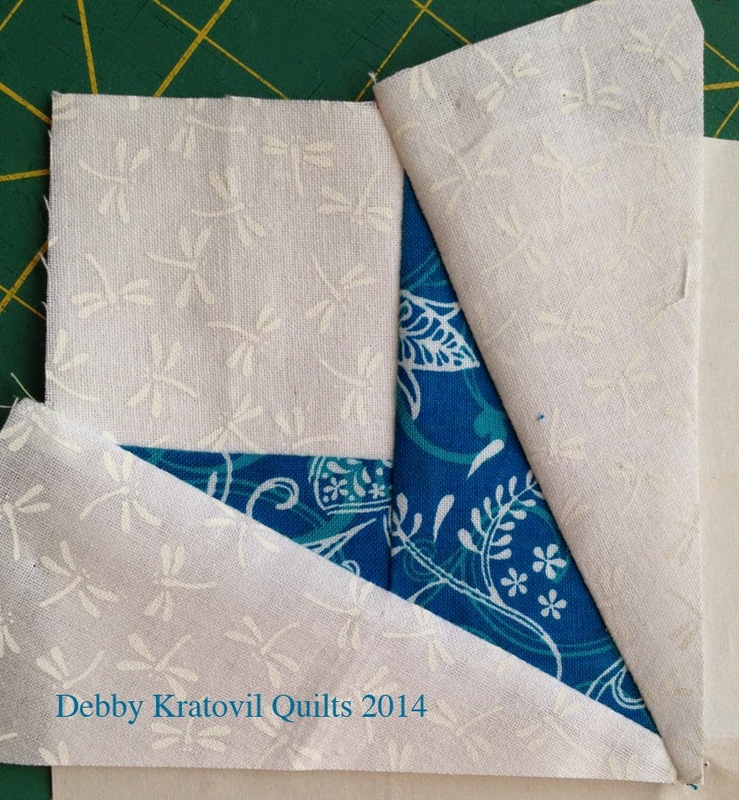 It is a 9 page pdf and yours to enjoy, even if you don't have any coverlets! Have a great day and weekend, whether you celebrate this American holiday or not. For several years I have taught my easy method for making a paper pieced Palm Block (also called a Hosannah Block). Traditionally, it was pieced using templates. Then when it was converted to a paper foundation, it was divided into two sections down one diagonal. I drafted it into an off-center log cabin. I don't like to guess with paper piecing. 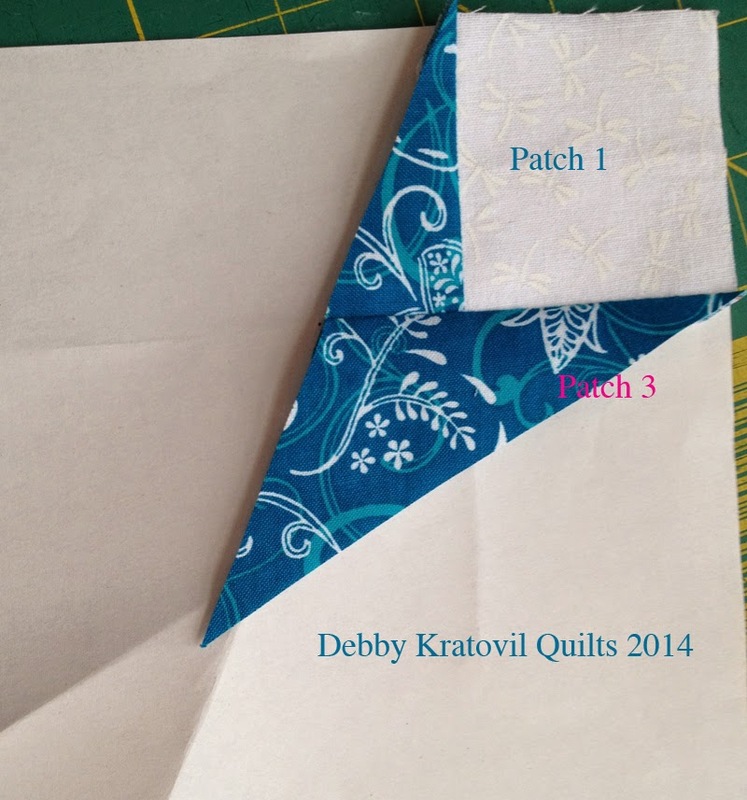 I figure out what size fabric patch to cut for sections, label them and line them up, just like in the photo above. Here is my step by step process for making a single block. 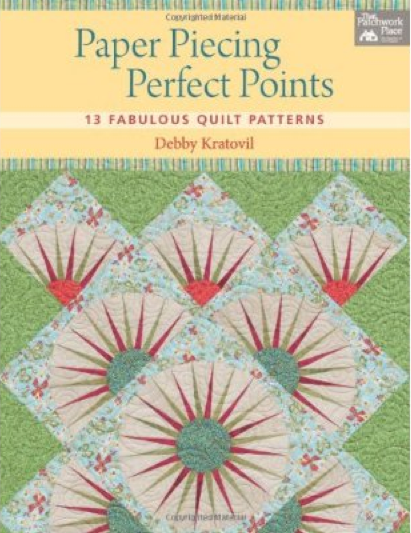 Let's begin with my pattern (as found in my book: Paper Piecing Perfect Points). And the quilt . . .
We will be sewing on the side with the lines. The fabric is placed on the other, non-written side. To make it easier to place the patches, I like to use a postcard and quickly fold each line . . .
OK. So what does the other side look like? Now it's time to place fabric Patch #1. Notice it's a square as shown in the first picture above. All patches are cut OVERSIZED. Pin in place. Now we're ready to place fabric Patch #2. 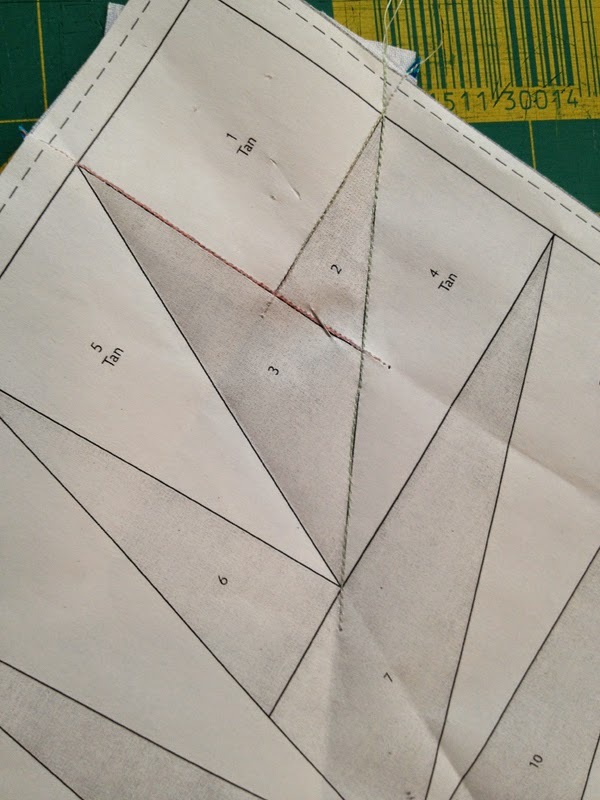 Just make sure that the fabric edge extending beyond Line 1-2 is only about 1/4". Align it, right sides together with Patch #1, keeping edges even. Pin. Turn work over. Sew as shown (you are sewing on the WRITTEN side of the pattern). Press the patches as shown below . . .
Now it's time to trim the edge of Patches 1 and 2 to get ready to add Patch #3. WHY ARE WE TRIMMING? Can't we just add a blob of fabric and guess it's placement by holding everything up to the light? I HATE THAT METHOD!! And it doesn't work. I like precision, not primitive guessing. See what happens next . . . The Add a Quarter ruler is a MUST. It has a lip that is 1/4" wide and with a sturdy postcard underneath, keeps things from slipping. 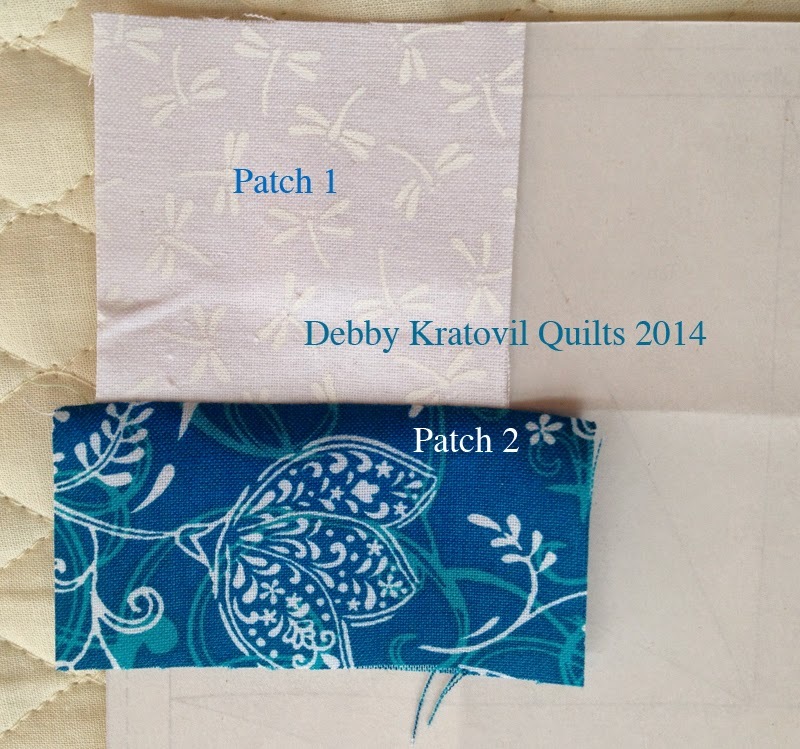 Place postcard on the line (Line between patch 2 and 4) which represents the next sewing line for adding a white patch. Fold paper back exposing the wrong side of the patch you just added. 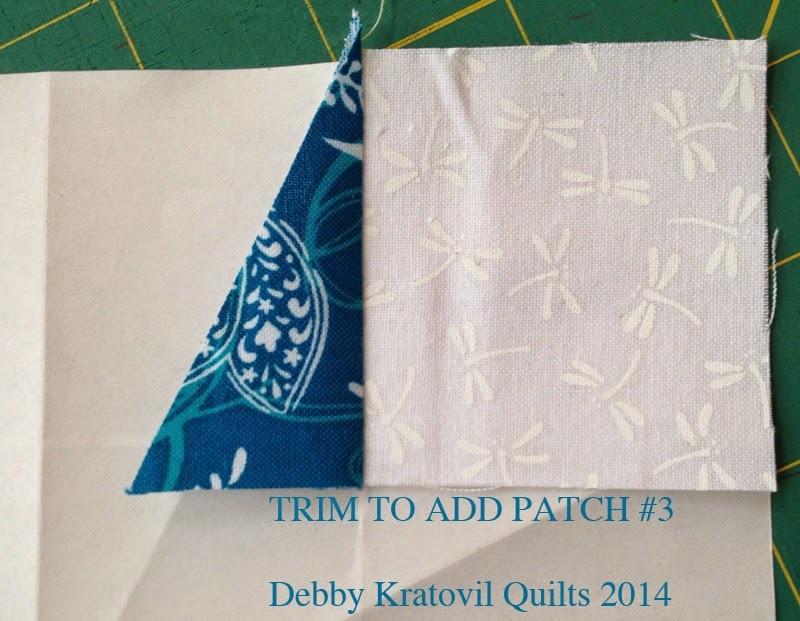 You need to trim the excess fabric from that patch so that there's a crisp 1/4". Notice what I trimmed to the right of the ruler. Discard. We just trimmed Patch 2 on the left side. We have to trim it at the bottom also. 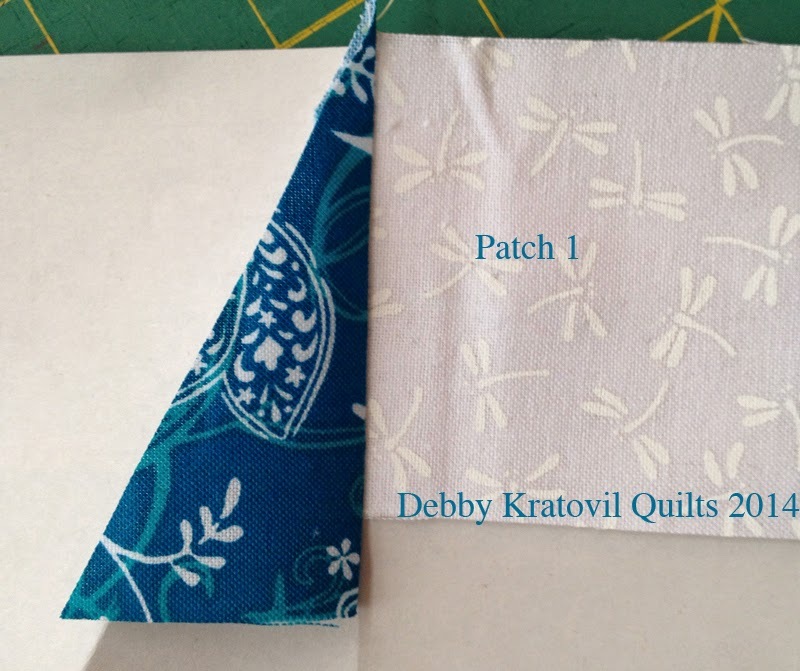 Now we have to trim Patch 1 and 2 so that Patch 3 (the blue) will have a nice, clean edge with just a 1/4" seam allowance. This way there's no guessing as to where to place the patch. Now we're ready to add Patch #3. Now let's trim Patch #3. I always start off the paper on the outside of my pattern. Do NOT stop at the edge of the seam allowance. We always sew in our seam allowances in traditional sewing. Also, notice that I go beyond the lines, into the other patch spaces. This ensures that my seams don't open up. This does not affect the next patch. Now I've added Patch #4 and Patch #5. And trimmed them, ready for their neighboring patches to be added. All patches added. Can you see those awesome points? This is Sewing by Number, one at a time. 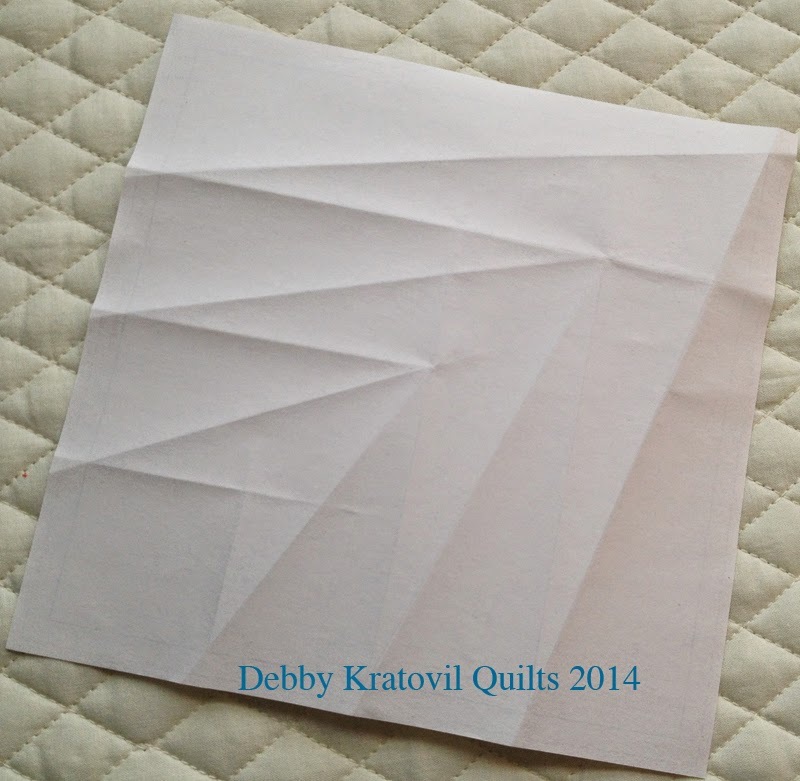 I leave the paper on until I'm ready to join it into my quilting project. I do not sew seams with the paper on. There is too much bulk and I don't like to pick away the paper in the seams. 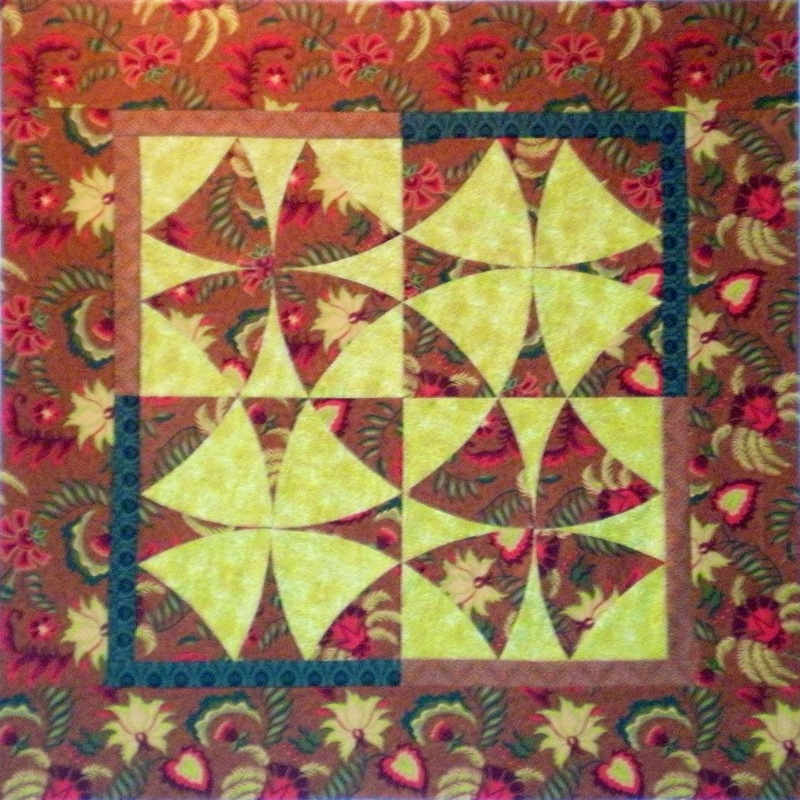 Finished block (with seam allowances). Lovely points, huh? 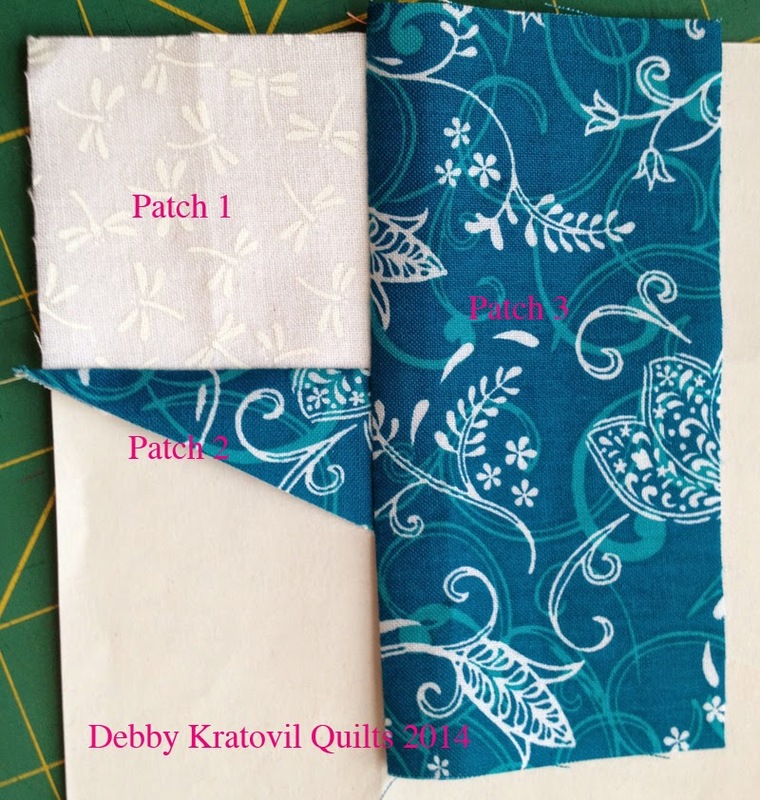 And what is my project made with this block and the other fabrics shown above? 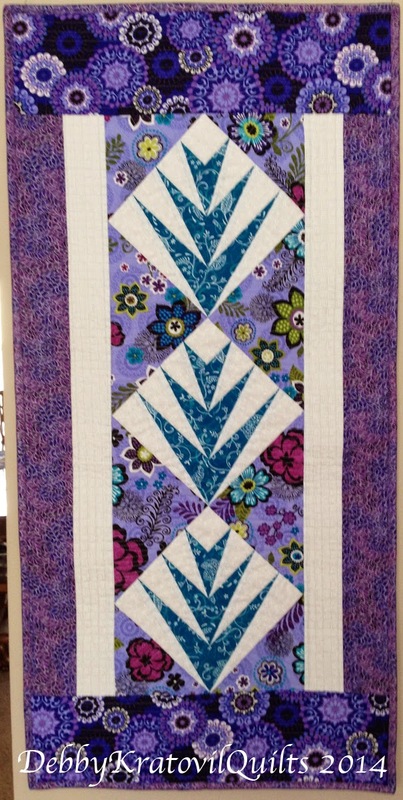 And here is another quilt using my Hosannah block. 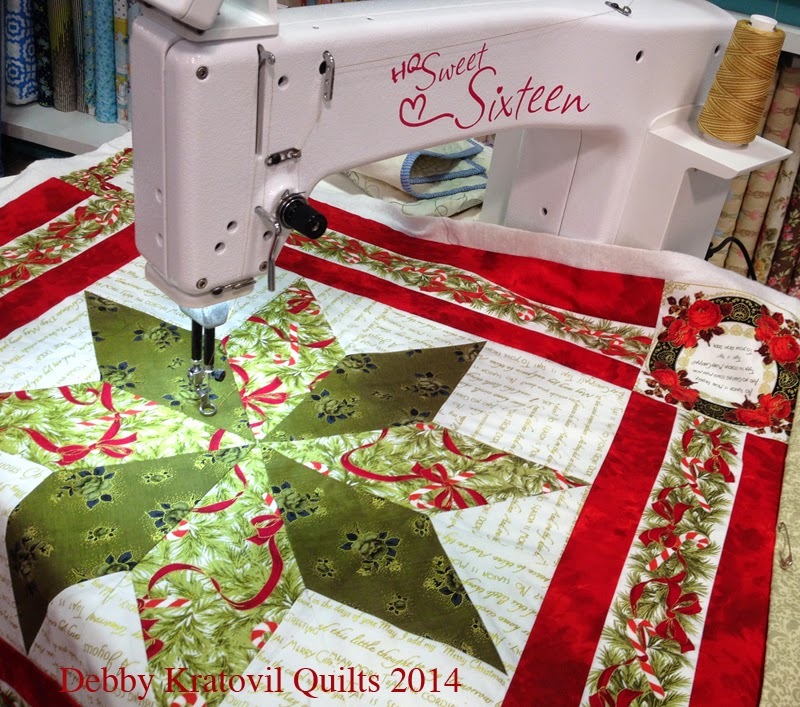 This is a new workshop with the Original Sewing and Quilting Expo. I had very enthusiastic class in Raleigh last weekend and everyone's blocks were just beautiful. I will be teaching this in Pittsburgh, PA, August 14. Then it is a regular class throughout the Fall and into the Spring in each of the 14 cities. 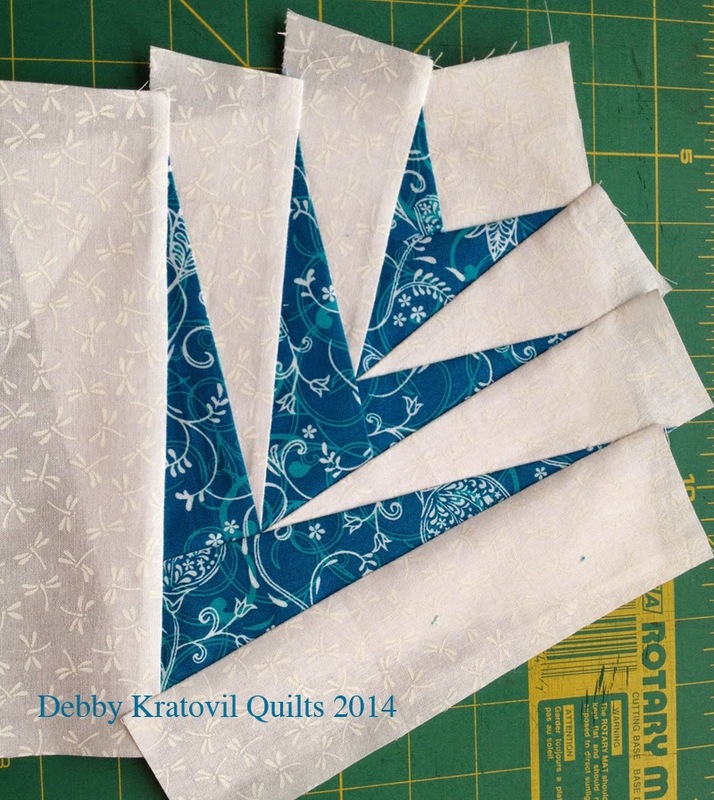 I have several quilts and pillows, etc made with these blocks in sizes ranging from 6" to 10". Once the patches are cut, you can sew without too much thinking. I'll show you some of those another time. 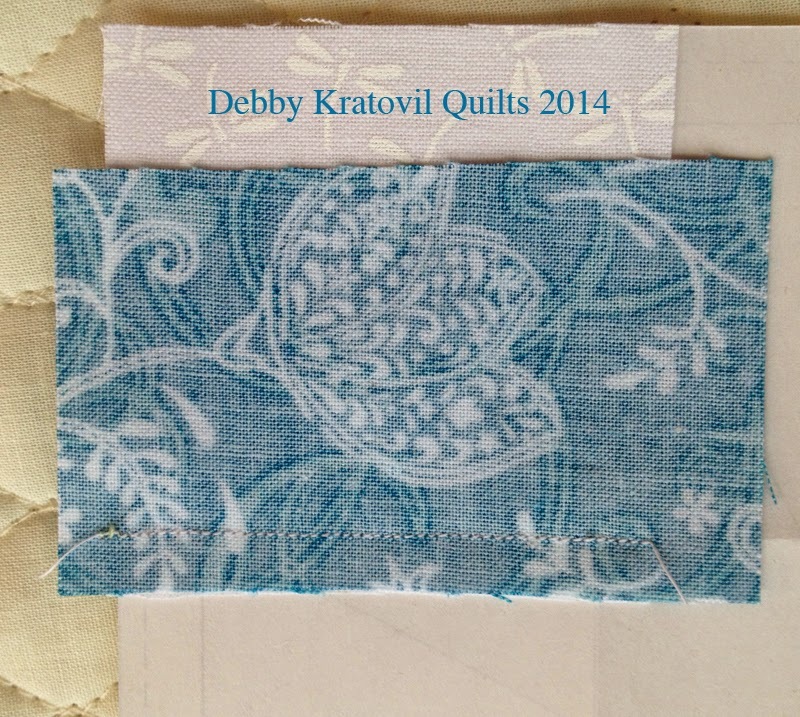 For now, I'm going back to my sewing machine to make a few more samples for my upcoming classes.